Load It Up with a bumper bundle of Holdsworth themed kids kit. Ice Cream themed Kids t-shirt in heavyweight plush cotton with contrasting arm and neck seams- do you want one flake, or two? Kids love hats and caps and beanies so you can take your pick from a Holdsworth Ice Cream or DeeDar cotton cycling cap and choose from either our Holdsworth Team Beanie or one of our over-the-top Bobbly Dazzler Beanies. Plush knitted warmth or classic cycling style for every head. The Holdsworth Ice Cream Travel Tote bag is the perfect carry-all for those quick trips out. Whether popping into town for some fun with the kids, travelling or shopping you can carry all your essential items in safety and style. It might even look sweet replacing a Xmas Stocking under the tree. Ice Creams on the soles of your feet, fun themed kids socks that follow the Holdsworth ice Cream theme. Super durable, these hardwearing socks are just what you need to keep little tykes feet warm. Carnacs Kids Gripper Gloves are the smaller version of our best-selling adult gloves. Smart for running round the streets, playing the park or even riding their little bikes. Hardshell EVA Bottle Cage Case with internal storage compartments. Perfect for the kids to carry round their personal stuff, its even a great pencil case for school. 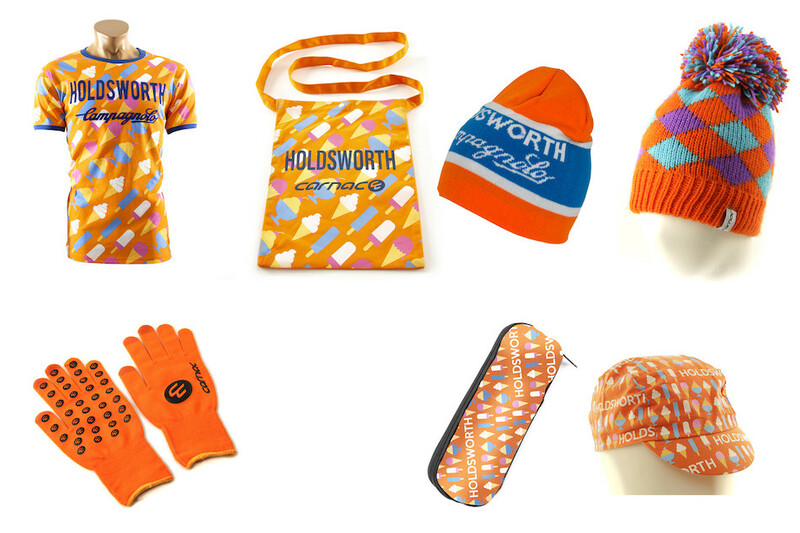 Its a cracking bundle stuffed with our best-selling bits of Holdsworth kit, there's plenty in their to keep the little ones interested and it's a sure smash for the aspiring cyclist in your family.